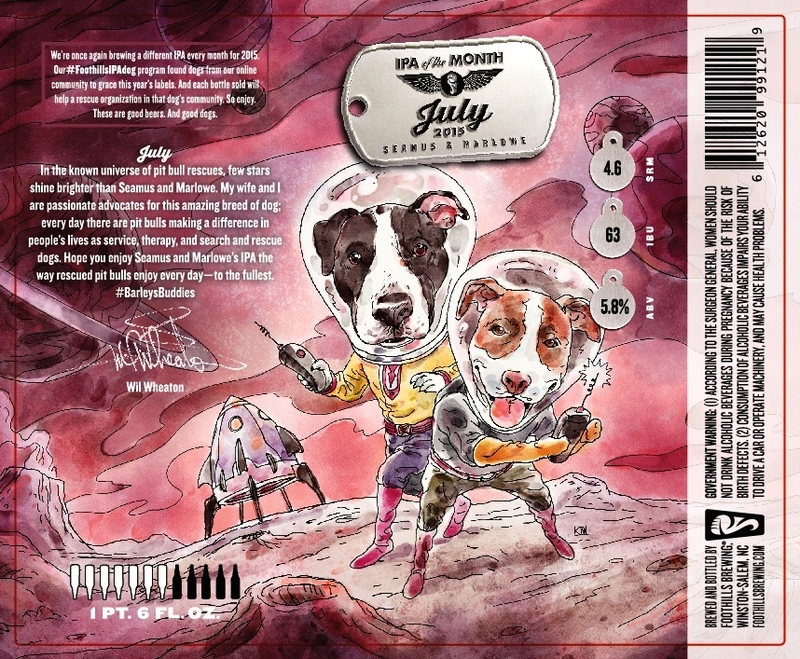 EDITOR’S NOTE: what follows is a full transcript from our interview with Wil Wheaton about featuring his pit bull rescues, Seamus and Marlowe, on our July IPA of the Month label. Foothills: How did Seamus and Marlowe come into your life? Wil: A few years ago, our dog, Ferris, died suddenly and unexpectedly from cancer. It was a crushing loss to our family, and while we grieved, we decided to walk in the Pasadena Humane Society’s Wiggle Waggle Walk, which is an annual fundraiser for them. I wrote a memorial for Ferris on my blog, and linked it to our fundraising page. We were hoping to raise $7000, because she was with us for seven years. The Internet got very generous, and in less than a week we had raised around $13,000 for Team Ferris. Someone from PHS contacted us and said, “Um … who are you people and how in the world did you do this? !” We told her our story, and she asked us if we would be willing to walk a shelter dog in the walk, as a way of raising adoption awareness. We thought that would be awesome, so we said yes. On the morning of the walk, Kevin, an adoption coordinator at PHS, brought this happy, dopey, incredibly affectionate puppy over to us. That dog was Seamus (though at the time we just called him “DOG”, a nod to Half Life 2). My wife Anne and I were not interested in getting a new dog, and the timing was all wrong for a bunch of reasons, but it took us about a mile of the three-mile walk to completely fall in love with him. I quietly slipped off his “ADOPT ME” bandana, and by the end of the walk, we had put ourselves on a list to adopt him. A few days later, he came to live with us. After we’d had Seamus for a few years, we stopped by PHS (where Anne has become a board member) to drop off some paperwork. While we were visiting with Kevin and some other staff, and telling them how much we loved Seamus, one of their employees brought in a tiny puppy who had the happiest face you’ve ever seen. She looked like a little Staffordshire terrier, and I remember saying, “The thing about these dogs is that …” then I saw her, and continued, “they are just so dopey and happy and lovable!” As I said that, I crouched down to pet her, and she somersaulted into my lap. I fell in love before I drew my next breath. But we really couldn’t have another dog. Seamus was three, and our other dog, Riley, was ten, in no mood to have a puppy in the house. The next day, Anne and I were walking along the beach, and I said, “Just to be clear: there is no way in the world we can adopt that puppy, right?” I can’t recall what happened immediately after that, but I know the conversation ended with her calling PHS and asking to be put on the list to adopt her, if nobody claimed her. About a week later, Marlowe joined our family. We lost Riley about two months ago, and we all miss her terribly, but Seamus and Marlowe are closer than ever, and without the old lady in the house, are able to play as loudly and enthusiastically as they want. Foothills: How did you became aware of the #FoothillsIPAdog project, and what made you want to get involved? Wil: About eighteen months ago, my friend, Charlotte, informed me about the existence of Sexual Chocolate. Through the magic of Twitter, I was able to get a bottle for myself, and I became a fan of Foothills before the bottle was empty. 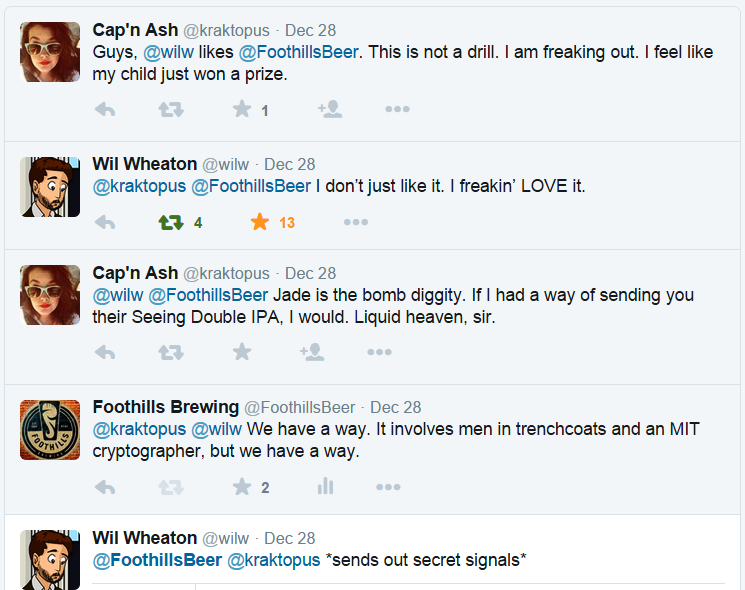 Since then, we’ve had a bunch of Foothills beers, including the #FoothillsIPAdog releases. I thought it would be awesome to have my dogs on a label because I love them, I love IPAs, and I love letting the world see how wonderful pit bulls are, contrary to some of the pernicious myths surrounding the breed. Foothills: Describe your reaction to seeing Seamus and Marlowe’s label for the first time. Wil: I thought it was amazing! I loved that they were exploring a planet that looked very similar to all those planets we saw in 1950s B movies, and I thought they wore their space suits very, very well. That rocket ship is cooler than any of the spaceships I’ve gotten to ride in, too. Foothills: There seems to be a lot of traffic at the intersection of ‘dog people’ and ‘craft beer people’; why do you suppose that is? Wil: We love the good things in life, obviously. Foothills: So being able to combine those two passions in your own lives with this project has been gratifying? Wil: I’m just really happy and grateful that our dogs get to be part of this project. I’ve loved all the other dogs and their stories, and it’s really cool that Seamus and Marlowe get to be in such great company. Foothills: We’re often told one of the coolest parts of this project has been our donating a portion of the beer’s proceeds to a rescue organization in the community where that month’s dog lives; tell us about Pasadena Humane Society, where Seamus and Marlowe’s donation is headed. Wil: Animal rescues and humane societies do important and compassionate work for their communities. Pasadena Humane Society & SPCA does so much for the nine communities they service. The provide low-cost vaccinations, spay and neutering services (for free to Chihuahua and Pit Bull owners, because those breeds are so populous in their serviced communities), obedience and agility training classes, day care and boarding for dogs, and many other community outreach programs. Without PHS, I wouldn’t have Seamus and Marlowe in my life, so I’m honored and privileged to give something back with this month’s IPA. July IPA of the Month will be available beginning July 3rd at our pub and tasting room, as well as bars and bottle shops all across the great state of North Carolina. For shipments outside North Carolina, please contact Bruisin’ Ales. Categories: beer releases, brewery, craft beer, dog rescue, dogs, IPA, north carolina craft beer | Tags: beer, beer releases, brewery, craft beer, craft brewery, dog rescue, dogs, drink local, North Carolina craft beer, pit bull rescue, wil wheaton, worthy charities | Permalink. Where There’s A Wil . . . In 2014 we said ‘hey let’s make an IPA every month this year’. Or something to that effect. We have so many meetings I don’t recall exactly. Anyway the result was 12 tasty beers, complete with 12 lovely label ladies. 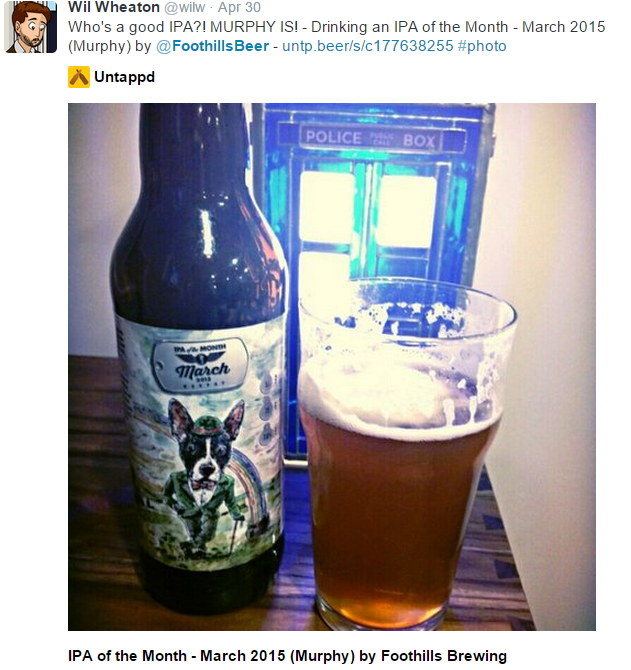 This year we shifted our IPA of the Month label focus to the canine companions of our Foothills faithful. Our crowd-sourced social media #FoothillsIPAdog contest netted close to 1500 entries. 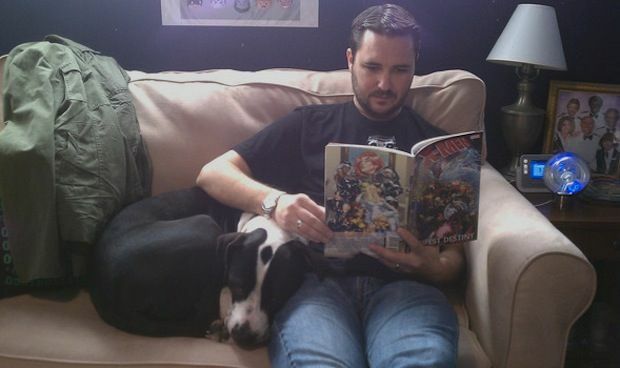 Backstory: yes, Wil Wheaton is a movie star. And a TV star. And an internet star. And an avid consumer of craft beer. Even ours. 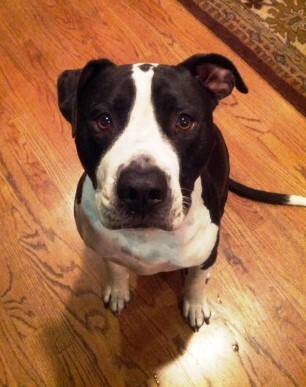 He is also, along with his lovely wife Anne, a passionate advocate for animal welfare, in particular pit bull rescues. The Wheatons work tirelessly to improve the lives of this misunderstood breed. They make videos. They make calendars. They hold fundraisers. 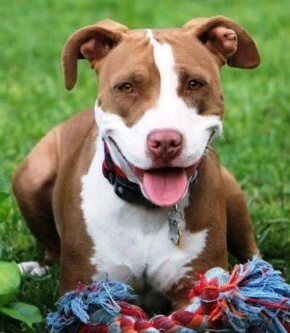 And they have two rescue pit bulls of their own – Seamus and Marlowe. In short, the Wheatons are truly fine dog people. 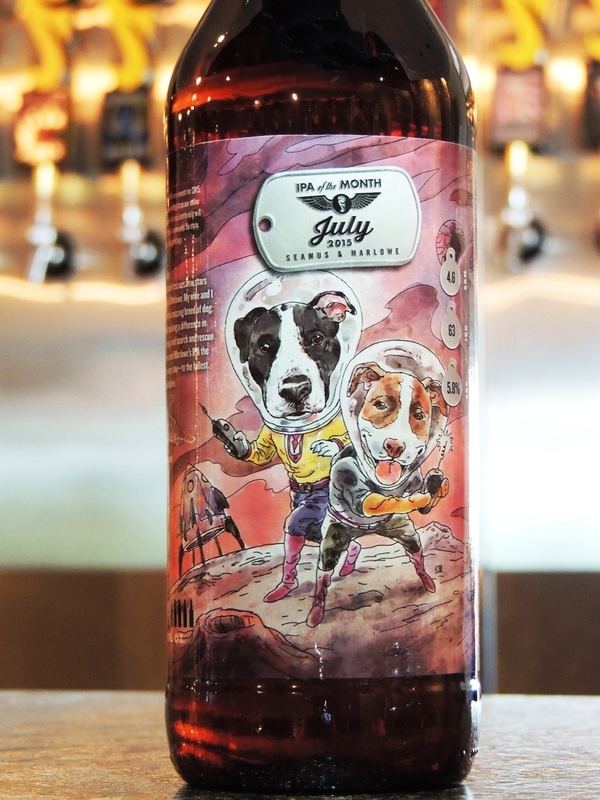 So we are honored to have Seamus and Marlowe join the corp of #BarleysBuddies as our July Foothills IPA dogs – complete with label copy from Mr. Wheaton himself. July’s IPA was brewed with Citra, Chinook and Sorachi Ace hops, with a unique addition of kiwi and lime during dry hopping. So how did we meet a Hollywood star and put his dogs on our label? Thank Sexual Chocolate for that. Wil became aware of our magic chocolate elixir through his Raleigh friend (and ours) Charlotte Moore, and, as he tells it, “I became a fan of Foothills before the bottle was empty.” That led to a few fun Twitter exchanges . . .
. . . and more Foothills beer being enjoyed at ‘Castle Wheaton’ — including this year’s IPA of the Month Series. Quite a statement — especially from a Star Trek: Next Generation alum. Kudos to our artist Kyle. As we do every month, we’ll donate a portion of the beer’s sales to a rescue organization in the community where our ‘label dogs’ live; in this case, the Pasadena Humane Society (where Anne is a board member). Bottom line, we are immensely proud to have the Wheatons join the Foothills Family. EDITOR’S NOTE: you can follow Wil’s award-winning blog (which we highly recommend) here. Categories: beer releases, brewery, craft beer, dog rescue, dogs, Uncategorized | Tags: beer, beer releases, brewery, craft beer, craft brewery, dog rescue, dogs, drink local, North Carolina craft beer, pit bull rescue, Sexual Chocolate, wil wheaton | Permalink.